Mind maps are a perfect way to visualize creative processes like brainstorming or summarizing hierarchically organized content like feature descriptions e.g. of a software product. But when it comes to the visualization of non-hierarchical organized knowledge of a whole system with interdependencies mind mapping will fail. 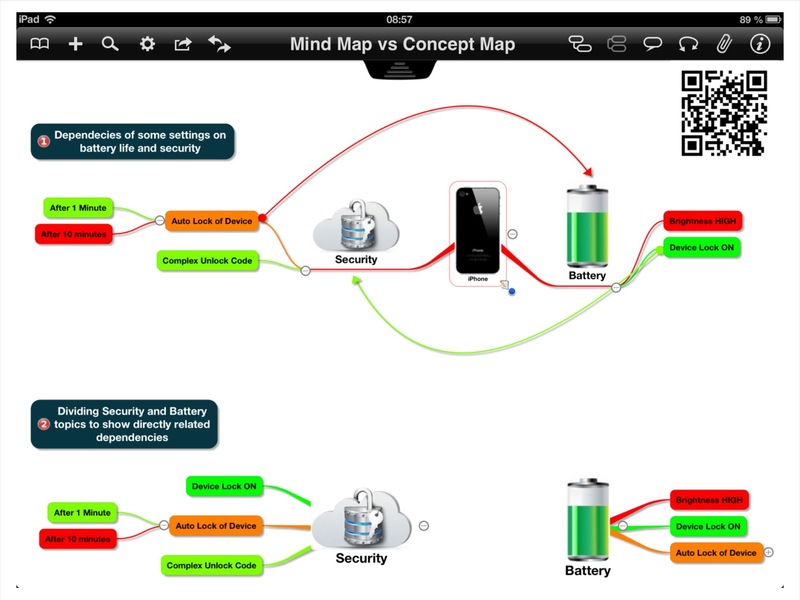 This article is about the differences between Mind Maps and so-called Concept Maps. 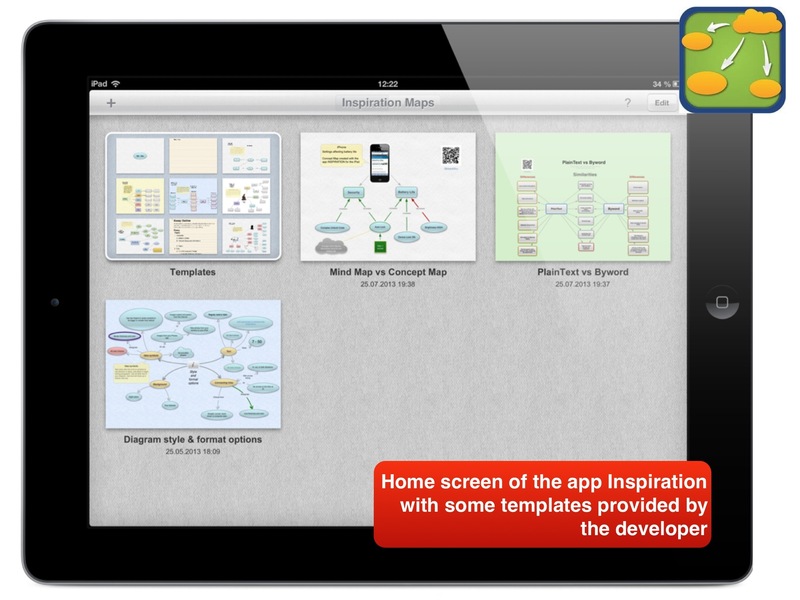 Additionally the app Inspiration (iPad) for creating concept maps is reviewed. 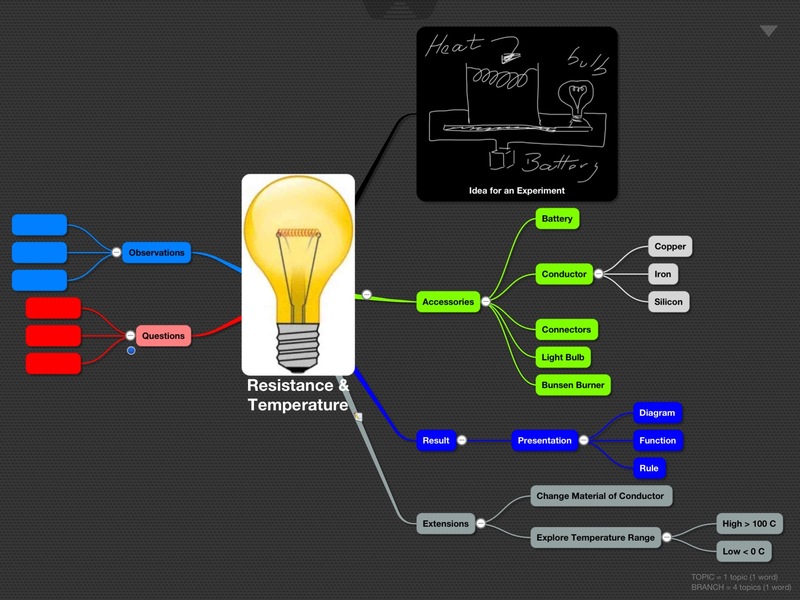 Mind Maps visually outline information in the way the creator thinks about the topic. Insofar it’s a subjective (or personalized) view on a topic. extend the primary question for getting more knowledge about nature, e.g. to repeat the experiment with other materials like iron or silicon. The example exhibits many of the characteristics of a Mind Map. Graphics bring it to life, and the subject is pretty clear, although the intended purpose of the map is not. The subtopics are certainly related to their parents, but not necessarily exclusively, and the exact nature of their connection is left to the reader to decide. That can be an advantage but at the same time a disadvantage too. A mind map is often created around a single word or text, placed in the center, to which associated ideas, words and concepts are added. Major categories radiate from a central node, and lesser categories are sub-branches of larger branches. Categories can represent words, ideas, tasks, or other items related to a central key word or idea. Ideas and information far away from the centre are usually regarded as the less important detail. It can be used as a result of a brainstorming process and gears to be extended by further ad-hoc ideas. So a mind map often reflects an ongoing process. Mind Mapping developed as a personal note-taking, memorization, learning and brainstorming technique is very effective, because the rich layout helps greatly with recall. Visualization of initially boring topics enforce pupils and students to further go into the details. A report format would not inspire pupils while thinking about this topic. Providing the mind map with visual mnemonics, colors, icons and links pools the information and goes along with satisfying the play instinct. Concept Maps visualise and communicate knowledge. Joseph Donald Novak (born 1932) is an American educator, and Professor Emeritus at the Cornell University, New York, and Senior Research Scientist at the Florida Institute for Human + Machine Cognition. He is known for his development of concept mapping in the 1970s. From the outset, Concept Maps were designed to communicate. A student’s Concept Map can be systematically evaluated by their teacher, to assess their grasp of a subject. The scope of their maps and their level of understanding of the relationships between ideas are a reliable indicator of their “knowledge” – what they have learned and integrated, not just learned by rote. It is one thing to know facts, but relating them to each other and understanding their influence on each other takes us from information towards knowledge. Facts alone do not help us to predict behaviour, whereas knowledge represented by models does. Mind Maps are captured visualizations of fairly independent objects gearing for extensions and loosing much of their relevance for people who weren’t involved in the creation process. The tree limb is just connected to the bole. Concept Maps visualize knowledge of whole systems with interacting elements and logic operations. In contrast to a tree limb objects are connected with basically all other objects like the orbs in the solar system where the gravity and the magnetic and electric fields define the interactions. If you are interested in a comprehensive description of the differences please read Nick Duffill’s excellent article about mind maps and concept maps (see the link below). He hit that nail square on the head. Within Apple’s iOS operating system some settings influence the battery life but cannot be summarized under one topic. Unlocking the device immediately after using it not only saves energy but also increases security. 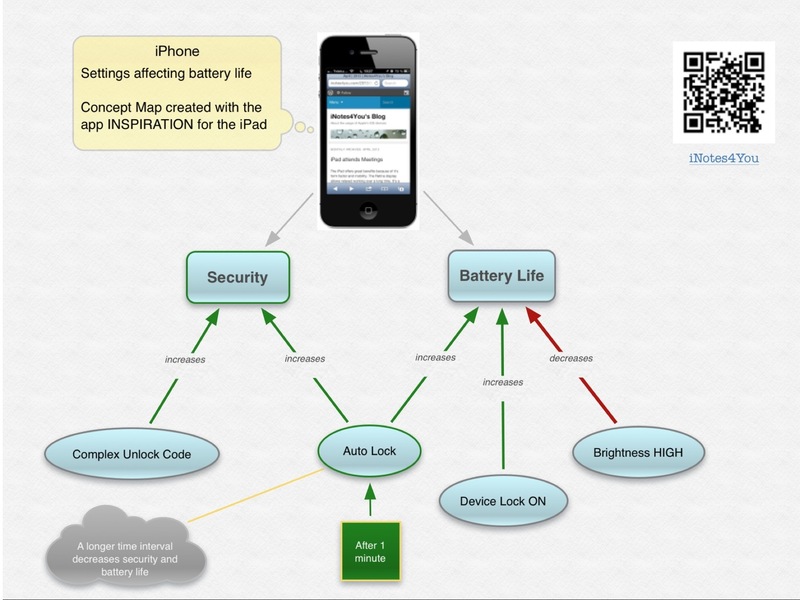 This is the visualization of some aspects regarding security and battery life with the help of a mind map. One way to point out the influence of unlocking on security AND battery life is to draw a cross-connection with a thin line. An alternative would be to split the map into two separate maps for security and battery life. This causes redundancy of topics. Here is the same topic visualized in a concept map without a tree structure where every subtopic is bound to a parent topic. In contrast the Concept Map visualizes the whole system with it’s interdependencies and it’s not limited to a strict hierarchy as some points are bound to more than one parent topic. In this Concept Map you can see that dependencies are going along with textual description explaining them. Concept Maps need less space an redundancy can be avoided. The user is bound to Dropbox except he uses the ‘Open In’ command to transfer the map to a file management app. From their it can be transferred to other cloud storages. Changing the background color from black to white should automatically change the text color from white to black. A nice-to-have feature would be the tap-and-hold gesture. If moving a note away from a topic the connection cannot be assigned any longer. 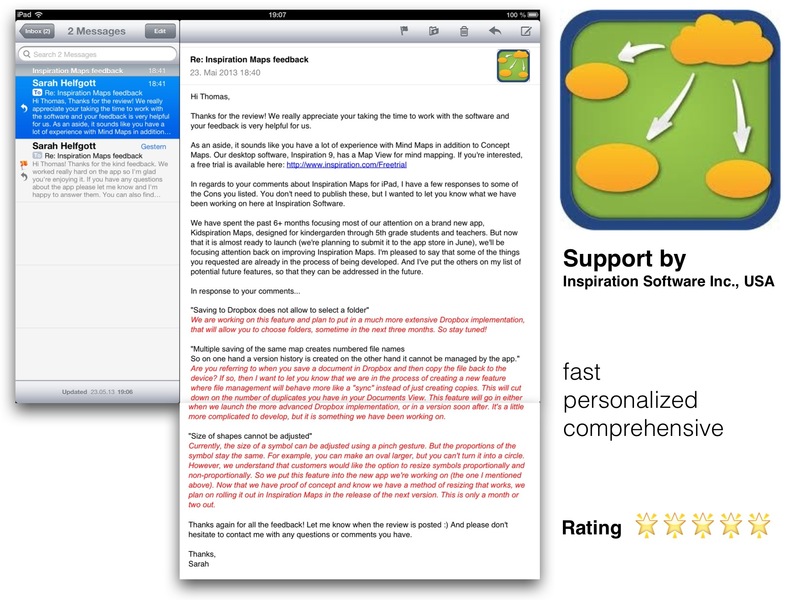 The app uses /apps/inspiration maps as the default folder. So it’s recommended to install the free Dropbox client app to manage the files. So on one hand a version history is created on the other hand it cannot be managed by the app. Inspiration is useful for easy tasks but a bit light weight for business purposes. See a detailed description of Inspiration under ‘Related links’. He suggested the app Inspiration, is an expert in mapping technology, and created the Google+ community ‘Mind Mapping’. He is an expert in mapping technology as well writing sophisticated articles about mind mapping and concept mapping. developer of the reviewed app Inspiration and intensively taking care of my questions.